It’s officially Spring Break season and as the weather continues to get warmer, the opportunities for marketing and advertising work within the travel and tourism industry just keep getting hotter. 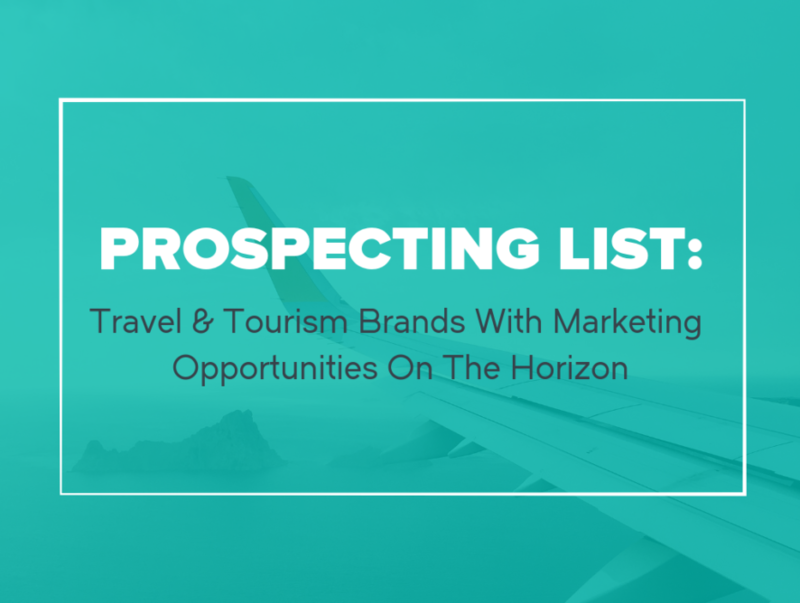 Utilizing Winmo’s smart filters and predictive intelligence, we’ve gathered a list of travel and tourism brands that have ripe upcoming opportunities for sellers and agencies. We’ve also attached a downloadable prospecting list with the names, titles and LinkedIn handles of the decision-makers on these accounts. For their direct phone numbers and emails, request a free trial of Winmo so you can reach them before the competition. After a record-breaking 40 million visitors in 2018 who spent $7.8 billion, Visit Seattle has announced its specific marketing focuses in 2019 in hopes of maintaining the growth. Additionally, the DMO just hired marketing director Mellie Lutz in October and special events manager Stephanie Huling Craig last July. More revenue typically means more marketing and more opportunities for you. The DMO wants to put greater reliance on data and personalization across each of its channels, which includes earned media, social media (specifically influencers), experiential, partnerships, targeted addressable TV, national TV, print and digital. Seattle’s vast music history and immigrant-friendly culture are substantial selling points, and the DMO just released a new campaign (created by PB&) promoting those backgrounds. Sellers with high reach among the DMO’s target audiences should go after last-minute revenue dollars. Aruba Tourism named Zeno Group its PR AOR to boost island travel. The indie agency replaces Zimmerman, incumbent AOR since 2012. Though the organizations spend spikes typically during Q4-Q1, expect to see summer spend as well. It targets adventure-seeking millennials and Gen-Z with digital, TV, social, influencers, print, events and local media throughout NYC. It recently extended its partnership with Airbnb. Since PR hires often precede other reviews, agency, and martechs with travel and hospitality experts should reach out for potential creative, media and/or digital dollars. After sitting down with Digital Dive, marketing lead of NYC & CO Nancy Mammana revealed details about the tourism group’s ongoing marketing strategy and its increased focus on events. This year the organization is relying heavily on digital and influencers, offering travelers the option to explore NYC authentically. Typically spend spikes during “economic need periods” (January-February and July – August) with events such as Restaurant Week, Broadway Week and Must-see Week. The organization also runs a campaign throughout winter. Target demographics primarily consist of millennials, and recent partners include Mastercard and Nickelodeon. NYC & Co also just promoted Mammana to CMO in February, and Jonathan Tesser was promoted to research and insights VP in October. The organization handles creative, video production, research, and analytics in-house, but does not have a media AOR and is open to project-based work. The airline recently selected Crossmedia London as its global media AOR after a review that kicked out incumbent Starcom, who had previously managed the account since 2015. Struggling for several years, the airline hopes increased marketing initiatives will help spread influence. Crossmedia began work immediately, so sellers should start sending pitches their way. Etihad typically spends the most during Q4 and Q1 and is targeting millennials who are avid travelers. Etihad tested national TV for the first time last year with a small allocation. It is not known whether they will reinvest in this channel, but media sellers should keep an eye out. Digital display is a top advertising channel, primarily across Google. Reviews tend to follow one another, so martechs and agencies should look out for future creative and/or PR work. Focus pitches on assisting the airline with profitability. Reviews tend to follow one another, so martechs and agencies should look out for upcoming creative and/or PR work. Focus pitches on assisting the airline with profitability. The growing scooter-share company, Skip, tapped Shalin Mantri as head of product, effective November and he brings extensive experience from his previous position at Uber. Additionally, the company has brought on Max Pike as head of growth, also coming onboard after a career with Uber. Being tasked with helping Skip grow, these two will likely influence future agency relationships. With new hires comes potential agency reviews so upon reaching out, focus pitches on leveraging Skip’s government-friendly relations as it got permission from City Hall before releasing its scooters, and its tech savviness (the scooters have latches as well as cameras and locks) to help the brand stand out from competition such as Bird, Spin and Lime. Skip has primarily relied on social media, earned media and word-of-mouth to attract attention. Though with the increasing competition within this space, it is expected that the company will move beyond PR and into traditional or digital mediums. Expect to see a more substantial investment in marketing as Skip just secured its $25M Series A round and $100M in debt financing. Sellers with high ROI through PR or digital should keep an eye out for increased spending. The brands top spending period is unknown, however, spend will likely spike this spring and summer as their product is mostly used during warmer seasons. We will keep this one short and sweet. Capital Region International Airport has issued an RFP soliciting proposals from qualified agencies to develop and implement marketing, branding and website services on a project and ongoing basis, according to the RFP. Check out the RFP and be sure to get them over by the deadline, April 12th. Bonnie Wohlfert is the main point of contact. As promised, below is the downloadable sheet for contacts on these accounts complete with names, titles, and Linkedin URLs. Be sure to request your free Winmo trial for each of their contact information and insights on brands like these 24/7.